You are interested in learning more about the next computing generation especially about the internet of things? You want something that can easily, almost efficiently connect you to the internet of things? You already own a Raspberry Pi 3 or you are about to purchase it? If these questions relate to you in any way, this audiobook will be your best companion. 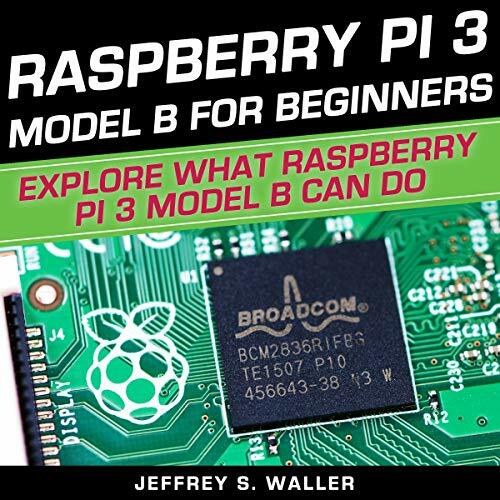 Get this audiobook now, learn how to get the most out of your Raspberry Pi 3 Model B, and take advantage of everything that modern technological advancements offer! Scroll to the top and click the "Buy Now" button. I bought four books on RPi. I have been using this one for a couple of months now. The amount of material covered is amazing, pick out what you need. It is well worth the price, I would rather have this than all of the three other books I bought together. I gave this rating because its easy to follow and for someone just starting it a great book. The way it gives URL address's is wonderful it makes great to work with your RPI. Explains the nuts and bolts for beginners. Possibilities I didn't even consider! Can't wait to get started with my RPI when it arrives tomorrow. The author is very knowledgeable and an excellent writer. This is one of the best overall technical books that I've read and I've read many. I would highly recommend this book to anyone planning to do serious work with the RPi. When I had trouble getting my Pi to work, this was the text I used. It was helpful and useful and even though the examples were not exactly what I was seeing on screen (because software changes more rapidly than books can be published to keep up with it), it provided enough basic information for me to configure my system and update it. All in all a very useful text. Good starter book for the Pi, includes comprehensive basics on Linux and peripheral topics to get you started. I'll be getting another book from Amazon focusing on Pi projects alone; hopefully there won't be any overlap. This book is exactly what it says it is - a beginner's book for users of the raspberry pi. I have found it a great place to start before moving on to more advanced books. I recently gave a raspberry pi as a gift to a friend. I gave him the pi and a copy of this book to go with it. Anytime I have needed to educate myself or to help educate someone else, I have always turned to the Dummies series of educational publications. They are extremely good at educating people on an easy to understand level. This book is no different! The topic is new and the information is excellent! The book is packed full of useful information and how-tos. The authors explain everything from the ground up. It's easy to follow, easy to understand, and provides plenty of useful and interesting information. I particularly enjoyed the sections of projects like how to program a simple game with Scratch, how to program with Python, etc.